A Locally owned company that has proudly served the Corridor for over 40 years! At ABC Disposal we strive to provide superior services that Customers recommend to their families and friends, Employees are proud of, Businesses select for their employees, and the Communities we serve trust. "Our family started ABC Disposal Systems in 1976 with one residential garbage truck and the desire to care for, and serve our customers to the best of our ability. Since that time, our customers have rewarded us with their trust, allowing us to partner with them to solve their trash and recycling needs. Today, we feel all of our employees are a part of our family. We could not serve our customers without them. No matter how large we become, we are determined to continue to serve all our customers with the same integrity and hard work we started with so many years ago. We thank you for your business, and appreciate the opportunity to serve you." We proudly serve the following communities and many more..
ABC Disposal is proud to provide construction waste disposal services to builders, home owners, and construction businesses across the area. Our service experts offer special pickup services for construction garbage, ranging from large commercial construction sites to smaller home renovation projects. ABC Disposal will work with your business to form a customized recycling program that fits your commercial or industrial recycling needs. Our skilled professionals will help you create a regular and proper recycling plan that could help to lower your waste costs, and enhance your business image with your customers. ABC Disposal offers residential trash services for homes in the Cedar Rapids - Iowa City Corridor Communities. Our curbside collection services make our residential trash service convenient for you. By offering 96-gallon, 65-gallon, and 35-gallon size trash cans on wheels, ABC Disposal guarantees that we have the highest concern and care for your products, safety, and privacy. From a special residential garbage pickup to scheduled weekly collection, our professional and friendly drivers can be counted on to pick up your household waste on time. ABC Disposal's curbside recycling services make our residential service convenient for you. We offer dependable residential garbage pickup to the Cedar Rapids Iowa City corridor communities we serve. By offering 35-gallon, 65-gallon and 96-gallon trash cans on wheels, ABC Disposal guarantees that we have the right service for you. From a special residential garbage pickup to scheduled weekly collection, our professional and friendly drivers can be counted on to pick up your household waste on time. 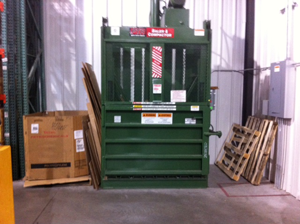 ABC Disposal works hard to be a one stop shopping service suppler. Offering storage containers allows us to serve you even better. These containers can be used at job sites for construction, at retail businesses to store important and valuable product or at a personal site for whatever needs you have. Containers come in two sizes, so contact us and one of our knowledgeable staff will help you get the storage container you need. Reduce…reuse…recycle. Throughout America, at almost every company and business regardless of size of type, there is a growing need to adapt sustainability practices that reduce waste and recycle materials that are reusable. Customers are demanding it, and state and federal regulations are mandating it. Among the most recycled of materials is paper. Paper production accounts for about 35% of the world’s felled trees. It has been estimated that recycling half the world’s paper would avoid the harvesting of 20 million acres (80,000 km²) of forestland.